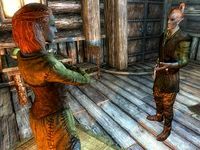 Dravin Llanith is a Dunmer farmer who works and lives at Merryfair Farm. He is married to Synda Llanith. Dravin wears a set of farm clothes and a pair of boots. He is equipped with a leveled dagger which can be up to elven quality, and carries a selection of common loot and gold. He gets up early at 5am and starts his day with a one-hour breakfast. He then heads outside to farm for most of the day, only to stop for a one-hour dinner in the farmhouse. At 11pm, he finally calls it a day and goes to bed. Due to a recent incident, he will not be friendly when you first approach him, saying: "Who in the name of Azura are you? ", "It's not safe around here. There's thieves out there looking to steal everything you own. ", "You look suspicious. You better not be one of those damn thieves. ", or even "You even think of taking something from my house... and I'll kill you." You can ask him about what happened to his bow, and he will tell you: "A few days ago, some thieves from Riften broke in here and stole it! Can you imagine? Took the only thing of value we had. If you have the guts to head into the Ratway and get my bow back, I'll pay you what I can." If you offer to return his bow, he will say: "Thanks. It would be nice to have it back... means a lot to me." If you instead say you try and avoid thieves, he will be disappointed: "Fine. I'll wait until someone else with a little more courage comes along." When asked if he's had trouble with thieves, he will be annoyed: "Are you kidding me? We're all alone out here except for a few guards who couldn't give a damn about us. We make easy pickings for thieves looking to steal everything we worked so hard for. Not only did I [sic] they take my bow, but they took all of our coin as well. Nothing's sacred to these people." 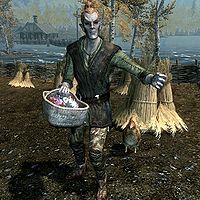 He will explain how he knew the thieves were from Riften: "I bumped into them when I was coming back to my farm after buying supplies. I know those lowlifes took it with them back to the Ratway. They left an unmistakable stench behind. It was a family heirloom. I can't even put a price on how much that thing means to me." As you leave to find the bow he will further tell you: "The Ratway is somewhere under Riften, shouldn't be too tough to find." or "Watch yourself out there or they'll take everything away from you." He may continue to grumble as you leave, mumbling: "Dragons, thieves and war. I should have stayed in Morrowind." Upon returning, he'll inquire: "So, has my bow turned up yet?" When you bring him his bow, Dravin will be overjoyed: "That's it! You found it!" Alternatively, if you have already found the bow before meeting him, he will exclaim: "That's it! That's my bow!" Either way he will continue with: "I don't know how you got it back, and I don't want to know. Frankly, I don't even care... I'm just so glad to see it again. Here, this is all can afford to give you as compensation. Hope it's enough." After the quest, he'll greet you with: "Thanks again for getting my bow back from those thieves. Next time they come knocking I'll be ready." "Dravin! What's come over you?" Dravin: "Synda... you left your dagger behind again yesterday. I told you, the road isn't safe." Synda: "Husband, you worry far too much. We are within an hour's walk of Riften." Dravin: "That doesn't matter. All it would take is a stray wolf or a bandit crossing your path... I can't bare [sic] to lose you after everything we've done." Synda: "If it puts your mind at ease, I'll take it with me. I'm sorry." Synda: "Dravin! One of the soldiers I spoke to on the way home said you threatened them. What's come over you?" Dravin: "I can't stand them, they represent everything I hate about Skyrim. They're tearing the place apart!" Synda: "All you'll accomplish by threatening them is ending up in the Riften dungeon. You're lucky they didn't take you seriously." Dravin: "Sorry, Marise [sic]. I just can't sit back and watch them treat us like a resource. This is our home!" Synda: "I don't care! Just stay away from the soldiers and keep to your business. It's the only way we'll make it through this." Bow to the Master: Retrieve a farmer's stolen bow. This page was last modified on 18 October 2018, at 00:03.